In June of 1994, this power-grunge trio from industrial Newcastle, Australia entered a national demo competition. Their song, Tomorrow, was chosen from over 800 entries, and the prize was a day in the recording studio of Australia's national alternative radio network 2JJJ-FM. silverchair recut Tomorrow and handed over the tape to the station; the song was added to the playlist, and listener response was so overwhelmingly positive that soon Tomorrow was bumped up to heavy rotation. By December, Tomorrow was the #1 song in Australia -- and silverchair were one of the most popular bands in the country. Mind you, this was before the trio had signed a proper recording contract, much less released an album -- certainly an unusual sequence of events. 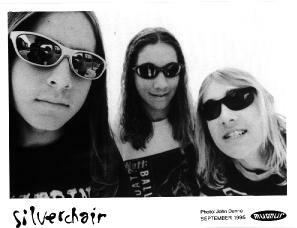 By the time of their pact with the Sony-affiliated Australian indie Murmur and the release of a four-song EP, silverchair had amassed a large and devoted following. Still, no one expected their next single, Pure Massacre, to follow Tomorrow up the charts, leapfrog over the earlier track, and claim the #1 position even as Tomorrow remained in the Top 5. But that's exactly what happened. frogstomp is a stunning debut, and a portent of even greater things to come from the band called silverchair.